October 15 sees a unique Fender Stratocaster go up for auction, signed by the four best-known members of the band - David Gilmour, Roger Waters, Nick Mason and Richard Wright. 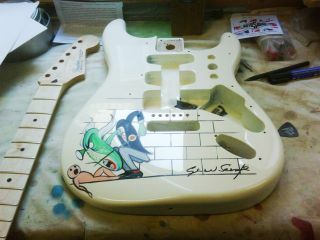 The guitar's finish has been designed by UK artist Gerald Scarfe, who worked closely with the band on the album and film of The Wall (1979). It's 'only' a Mexican-made Fender Stratocaster underneath the finish, but the guitar's uniqueness will make it highly sought after. The guitar's scratchplate (below) was signed by all four members of the band only weeks before Richard Wright's recent death. The one-off guitar is being auctioned in aid of homelessness charity Crisis. To register to bid in the auction, go to the Buy Once Give Twice website. The winning bidder will also receive a Scarfe On The Wall Limited Edition Box Set. This comprises eight prints signed by Gerald Scarfe (pictured) and an in-depth interview regarding the time when he created the illustrations for The Wall and the accompanying film. Roger Waters has signed the accompanying 'monograph' book which includes many early concept drawings for The Wall and a new interview with Scarfe. The monograph is accompanied by eight 16" by 20" prints of Scarfe's famed illustrations for The Wall, which includes three unseen works. The boxset is also available to buy, in a limited run 300 pieces.